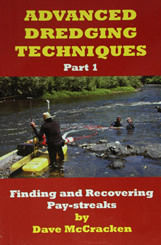 If you enjoy dredging for gold, then this book is for you! Dave McCracken tells you all you need to know about pay-streaks; what they are, how they are created, and most importantly, how to dredge them up without leaving gold behind! A smart investment for any dredger. 241 pages of essential information squeezed into a 5.5" x 8.5" paperback. "It Has Already Been Dredged!" Watch Out for the Con Artist!